Viajando en tren - China: Ferrocarriles chinos. Yo, haciendo el payaso en un vagón de tren camino de Datong. El tren es un medio cómodo para viajar entre ciudades, pero hay que reservar con antelación. 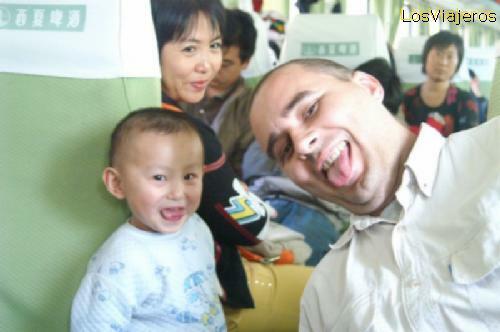 Travelling by train - China: Me making the clown in a train coach to Datong. The train is a comfortable way for travelling among cities, but it is necessary to reserve in advance. Templo de los Lamas -Beijing- China Yonghe Lamasery or Harmony and Peace Palace Lamasery - Beijing "Index"
Fotografias comentadas de viajes por China: Una foto al dia de China: Beijing, Pekin, La gran Muralla, Xian, Shanghai, Chengdu, Datong, Pinyao, Suzhou, Xiahe, Tibet, Juizhaigou. Pictures of travels in China: China, one picture per day: Beijing, Great Wall, Xian, Shanghai, Chengdu, Datong, Pinyao, Suzhou, Xiahe, Tibet, Juizhaigou.